Source: Japan and the United States. Handling Tips: 35 - 40° F.
General Information: The term Asian pear describes a large group of pear varieties having crisp, juicy fruit. When mature, the fruit are good to eat when harvested or for several months after picking if held in cold storage. The crisp texture of an Asian pear remains unchanged after picking or storage, unlike the flesh of European pears such as Bartlett or Comice. There are three types of Asian pear: round or flat fruit with green to yellow skin; round or flat fruit with bronze-colored skin and a light bronze-russet; and pear-shaped fruit with green or russet skin. They are hard to the touch even when ripe. Asian pears have a crisp, juicy and very refreshing meat that is a cross between an apple and a pear. Best enjoyed raw, they can be poached or sauteed. When cooked they retain some of their inherent temper. Good source of vitamin C.
Asian pear cultivars are numerous with over 25 known in California and hundreds of cultivars known in the Orient. Selection of the better cultivars for planting and future sales is a problem for all involved with this crop. The more important cultivars available in California are discussed with some ripe dates indicated for Davis, California. In Fresno, ripening will be 7 days earlier; in Oregon and Washington, about 21 to 30 days later. Varieties are listed in order of ripening. 'Shinsui': An early-maturing, brown fruit with reasonable size, ripening in mid-July after 'Ichiban Nashi' and before 'Shinseiki'. 'Kosui': A small, flat bronze-russet early-maturing, sweet fruit with a tender skin that ripens in mid-July. A strong-growing tree with leaves sensitive to 2-spot spider mites and many sprays. 'Shinseiki': A round, yellow-skinned, firm fruit that is early-maturing (late July) plus it stores well up to three months. In appearance it resembles '20th Century' but is less flavorful. Trees are self-fruitful in the San Joaquin Valley. They require no pollinators. Fruit holds on the tree well and is often color-picked four times per season. Heavy thinning is necessary for good fruit size. 'Hosui': A very large, juicy, sweet, low acid, bronze-skinned pear that ripens in early August. The tree is extremely vigorous on P. betulaefolia and has a wild, loose growth habit. This is a very popular new cultivar in Japan and California. It gives good consumer and grower satisfaction. It is usually very susceptible to fireblight and stores for four to six weeks. 'Kikusui': A flat, yellow-green, medium-sized fruit with excellent flavor but a reputation for having, tender skin. The fruit stores well until February but the dull-colored skin makes it less attractive at harvest than '20th Century'. The fruit sizes better and has flavor and texture equal to '20th Century'. It ripens in mid-August but fruit has preharvest drop problems. Tree has average vigor. 'Yoinashi': A large, brown-skinned fruit with excellent flavor. It ripens in mid-August with '20th Century' but sizes much better. '20th Century' ('Nijisseki'): This is the best flavored and most popular Asian pear in Japan and California. It originated in Japan in about 1900 and was responsible for the high popularity of pears in Japan. It is round, yellow-skinned, easily bruised, but stores well up to six months. The fruit is more difficult to size than other cultivars but its popularity outweighs this problem. It should not be grown on P. communis rootstock because it is severely dwarfed. The fruit ripens in mid-August. It grows well on P. betulaefolia, P. calleryana, and P. serotina. Old trees need spur removal and rejuvenating pruning to maintain fruit size. The tree is naturally well shaped and easy to handle. 'Chojuro': An old, firm, brown- to orange-skinned, flat-shaped, highly productive cultivar is losing popularity because it is not as juicy as many newer ones. It matures in mid-August, bruises easily but stores for five months. It must be picked when first yellow-brown in color or fruit is subject to severe bruising and skin discoloration. 'Shinko': The fruit is large and round to slightly flattened with a beautiful bronze-russet skin. Fruit flavor is excellent in hot climates but the fruit stores only about two months. The tree is well shaped and extremely productive, an annual bearer despite heavy crops. It matures during the first week of September and appears to be nearly resistant to fireblight. 'Niitaka': A very large, firm, brown-russet fruit. It is noted for its large size, average flavor and high production. The tree is dwarfed severely on P. communis and vigorous on P. betulaefolia. Fruit ripens in early September and stores two months. The flowers are pollen-sterile but it sets well when cross-pollinated with most varieties. 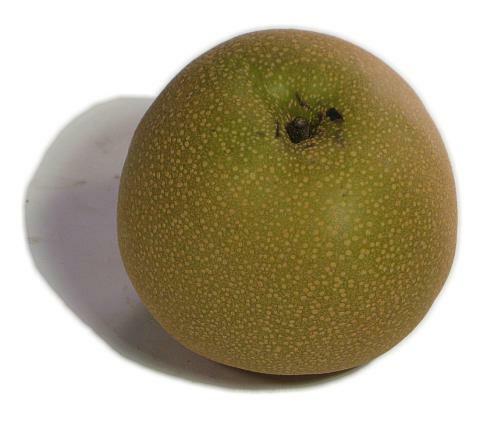 'Ya Li': A popular Chinese cultivar, is pear-shaped, has green skin and is quite tender to bruising. It is early blooming and requires cross-pollination by other early flowering cultivars such as 'Tsu Li' and 'Seuri'. The flavor is sweet and milder than other cultivars. When properly thinned and pollinated it sizes to 10 to 12 ounces. It is the most important pear cultivar in China. It stores well until February and keeps its green color. Trees are very productive and vigorous on all pear rootstocks. It ripens late in August and early September. This cultivar is slower to come into production than most Japanese cultivars. 'Tsu Li': A large, football-shaped, green fruit of only fair quality. It has long storage life (six to ten months) and gets better the longer it is stored. The fruit ripens in early to mid-September and develops a greasy feel on the skin. It must be pollinated by 'Ya Li'. 'Tsu Li' in California and 'Tsu Li' in China are not the same cultivar. 'Dasui Li' and 'Shin Li': New U.C. hybrids, very large fruit, greenish to yellow in color. They ripen in late September and early October and store well at 32°F for six months. Trees are extremely vigorous and pollinate each other. For good crops, limited pruning is essential in the second and third seasons to slow growth and encourage spur and fruit production. They grow well on P. betulaefolia or P. communis roots. 'Okusankichi': This is an old Korean and Japanese cultivar that ripens in October and stores well. The fruit is brown-russet, somewhat elongated and slightly irregular in shape. At harvest it has only fair flavor, but flavor improves in storage.